On Friday, April 19, families can enjoy a special price for a Fire Power Tour of the Battleship. Just $50 for families of three or four* from 10am to 2pm. 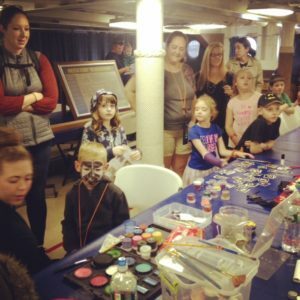 Plus, we’ll have face painting, temporary tattoos and balloon creations, performed by Bonbon’s Parties and Events, for all kids in the Wardroom, part of the Fire Power Tour! Our Curatorial staff will also have a special electricity display to show kids how the ship generated electricity. And pre-school children can play in the new Jason’s Kids Kompartment, presented by Lockheed Martin. Try on military uniform, captain the boat, play cook in the play galley and more! To buy tickets, call 866-877-6262 ext, 108.